It was about dusk when residents of Stronghurst came alert very quickly last Wednesday after hearing an explosion which had occurred at the Stronghurst Grain & Mdse. Co. Shortly after the explosion was heard, the fire alarm sounded and MST volunteers responded. Soon fire trucks from Gulfport, Gladstone, Biggsville and Raritan lined the streets to assist the MST Fire Department should the need arise. They were joined by Henderson County Sheriff's cars, Illinois State Police and the Henderson County Ambulance from Stronghurst, and a slew of residents who came out to see what the explosion was. It was reported that the explosion occurred in one of the top legs of the elevator and flames could be seen from a distance, but they were soon extinguished. 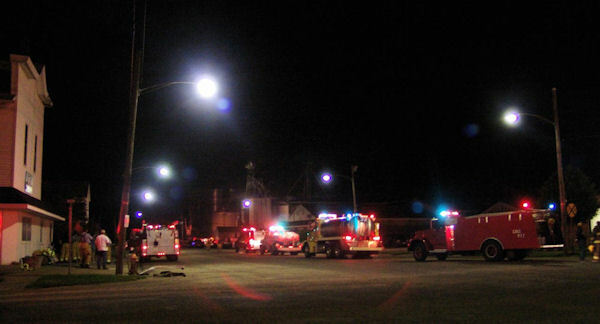 Residents gathered along downtown Broadway Street to listen to the chatter of firemen talk from two-way radios as they climbed up the huge grain bin and then up the tall legs where the fire had occurred. You could hear them talk about hot spots. It was a long way up for firemen and volunteers to get water to douse the flames, but they were able to hoist up a hose and get water there. It was said that a worker had been welding up there earlier in the day which could of been related to what some called "a dust explosion." Luckily the fire turned out to be a minor affair as around 10:30 or 11, fire trucks began to leave from out-of-town, and folks of Stronghurst could once again relax. Probably many of the volunteer firemen who came that night had been helping fight the flood waters all week and were relieved not to have to fight a fire also. When called, Kevin Box, manager of the Stronghurst Grain, the tallest and largest facility in the middle of town, said, "It was no big deal," and said "no comment" when asked about damage or what the cause was. However, residents and firemen in the community were a little more concerned, and very glad that it turned out to be "no big deal" in the end.. Some said they saw a ball of fire run clear down the side of it, others saw flames from within the legs. Spectators were concerned for those climbing about on the high facility, not knowing what could occur. It was pretty quiet on the street as everyone watched and listened. Police kept residents on the south side of the railroad tracks, and the ambulance remained until all was clear.